good reason, I suppose. I’ve seen videos of dads driving ATVs while pulling their youngsters in a Cozy Coup, jumping off a roof onto a trampoline, and starting a barbq with gasoline. None of which turned out well. 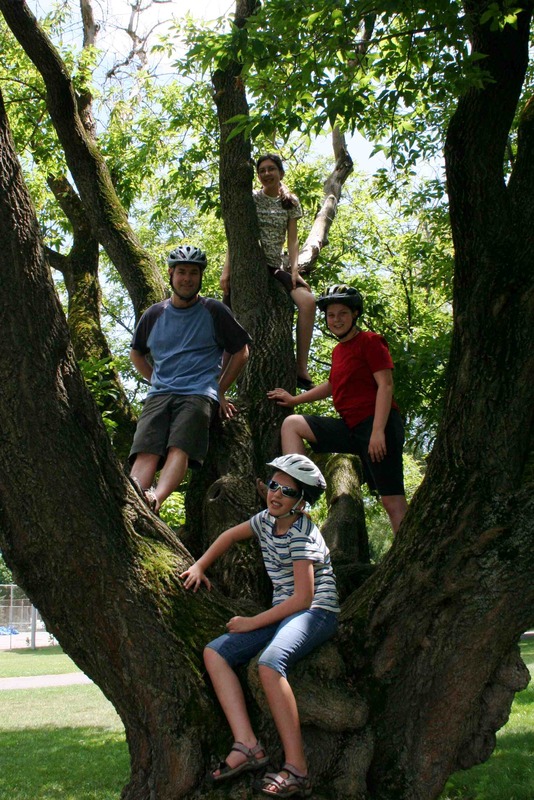 Last summer we were at a park on Centre Island in Toronto and came across a perfect climbing tree. I saw it. My daughters saw it. And we had to climb it. Here are some things I learned that day. 1. Dads want to see their kids challenge themselves. It fired me up when my kids wanted to tackle that tree. We get a rush from seeing our kids push their limits – whether it’s riding a bike, climbing a tree, or standing up to the schoolyard bully. 2. Dads allow their kids to take risks. Pushing the limits is all about risks. Its about trying new things out. In fact, dads tends to not just allow it, but encourage it. When my girls were in that tree, I wanted to see if they could get just a little higher – to just one more branch. 3. Dads allow kids to feel frustration. There are always moments in life when we reach a hurdle – when the next branch feels just a little too far. My youngest saw a branch she wanted to get to but felt a twinge of panic (as I did watching her). But she steeled herself and took that step of faith onto it. Dealing with their frustration and hurdles on their own, and with dad’s careful guidance, leads to better problem solving skills in our kids. 4. Dads tend to be active with their kids. And so our own safety is often in jeopardy. There are many times where dad is the one injured and the kids come home scratch-free. But the truth is most guys are acutely aware of their child’s safety. We are thinking about the tightness of the car seat, getting those electric plug covers installed, and adjusting the training wheels to the right height. But it never hurts to have a quick reminder of our role as a “safety guy”. Be aware – know where your kids are and know what your kids are doing. Awareness won’t get rid of accidents, but it will help you react when they are about to happen. Be close – do things with them. Keeping close gives you opportunity to intervene if necessary. Being with them is also just a good thing for your relationship. They need to know you are interested in them and what they do. Be trusting – encourage them to try new things. Let them push those limits and learn about their abilities. You will see true satisfaction on their faces. So, to use the tree climbing story, encourage your kids to climb, challenge them to reach new heights, – just be ready to catch them should they slip. I love this. I had a dad who let me test my abilities, take risks, fail and try so many things…and I am so thankful for it. Great post.